Ipomoea violacea is a common ornamental vine with heart-shaped leaves and bright white, pink, or purple flowers and small, black seeds that contain LSA. Because of its fast growth and prodigious seed production, many jurisdictions consider it an invasive weed plant. It has a long history of use in Central to Southern Mexico. Whats the best part of the Morning Glory plant to extract? How does one harvest morning glory seeds? Where on a Morning Glory plant do the seeds grow? Is it illegal to ingest or distribute Morning Glory seeds? 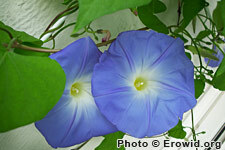 Does "Moonflower" refer to Morning Glory or to Datura?